Many of us struggle with prayer and yet the Bible is stuffed full of passionate prayers, breakthroughs and incredible encounters with God. Was all that something that used to happen in the Bible but now we're left on our own? No. God's very much still alive and kicking - and Carl Beech walks us through some of the real-life, gut-wrenching, painstaking, all-out weird encounters with God in his own life, in this day and age, all across the world. God is moving now. He never stopped moving. 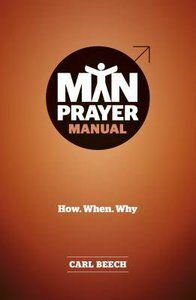 But how do we make time in our busy modern lives to invite God to work and not let prayer become a chore, but recognise it as the most powerful thing we can do[unk] Punchy, incisive and written to spur men into a dynamic life of prayer, Man Prayer is full of real-life stories and practical tips from Carl Beech. Coupled with Carl's wisdom and down to earth style, a must read for guys of all ages.